I confess to having had a crush on Thomas Jefferson ever since my parents took me to Monticello to “meet” him when I was eight (I also returned in 1993). What a mind! What a gourmand! I would love to have had dinner with him and his brilliant friends (and/or adversaries)! This book, therefore, is something I am very passionate about. It is short, but utterly engaging. Based on Mr. J’s journals — and other correspondence and documents — it encompasses the years 1784-89 when Mr. J. was a U.S. emissary to France. He made a contract with James Hemings, his half-brother-in-law and slave (! ), to apprentice James to (first) a caterer named Combeaux, and later, to the chef of the Prince of Condé in Chantilly (check out the château at the Musée Condé: what a cool place for an erstwhile slave — or anyone — to live in!) The contract stipulated that when James had mastered haute cuisine — and then had trained a successor in Mr. J’s household — he would be a freeman and could work for anyone anywhere he chose. Meanwhile, James was paid rather handsomely by Mr. J., who also paid the apprenticeship tuition. James, fortunately, picked up French right away, becoming fluent; Mr. J., however, never got the hang of it and tended therefore to associate primarily with fluent English speakers (of all nationalities) during his Paris sojourn. 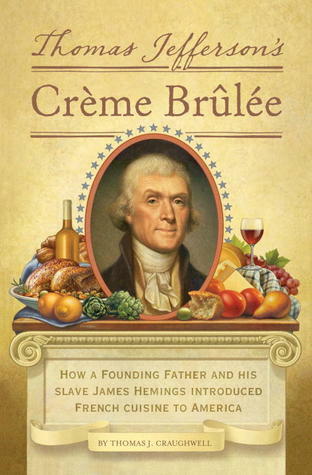 The upshot was that when politics got to be a bit dicey back in the U.S. of A., James (whose emancipation was delayed at this point) would provide a dinner (with Mr. J’s fine wines), and conflicts would be resolved over a fantastic meal. For example, when Mr. J. was Secretary of State under George Washington (in the capital city of New York), he had a dinner for James Madison and Alexander Hamilton wherein James’ cooking changed history. Mr. H. wanted to make the federal government assume the debt for the revolutionary war, as the individual states could not pay their parts of it. Mr. J. proposed that if the southern states had to pay (through the government) for the northerners’ debt, then the capital should be moved to Washington, to appease them and make them feel more included in the governing process. By the conclusion of the dinner, the compromise was drafted and — with Mr. J.’s support (he rarely supported Mr. H. in anything) — it was accepted by congress. However, it is his life in Paris that is most riveting. For example, he sent his two daughters to a private Catholic school, known for its good quality of education, even though he was not of that persuasion. However, when Martha (aka Patsy, the eldest) graduated, she announced that she wanted to be a nun. Mr. J. wisely did not argue with her, but instead, took her shopping for clothes and sent her to a ball or two where she met some charming young men. Needless to say, she dropped the nun idea without having to be asked. It was a great time to be in Paris, seeing the end of the ancien régime without knowing it was the end, and living through the early days of the revolution, especially as some of his cohorts from the U.S. (particularly the Adamses) were also there and commenting. Additionally, traveling through southern France with Mr. J. is a real adventure, and his theft of white rice seeds from the Italian Piemonte (at risk of execution!) is breathtaking. That is a trip I would love to replicate: and in 1977, I inadvertently did so, covering half of the journey. Anyone want to join me for the other half? As a result of these adventures, we now have mac-and-cheese, French fries, Italian rice and crème brûlée for which to thank Mr. Jefferson — and especially James Hemings. (Sally Hemings, by the way, was only 14 when she came to France and did not figure much in this story, as Mr. J. had a “friend”/lover in Paris). Unfortunately, Jefferson’s plan to grow French wines, cork, olives and other delicacies came to naught. But mac-and-cheese: who could ask for more? Get the book: you’ll love it!! This entry was posted in Earth and tagged James Madison, Thomas Jefferson. Bookmark the permalink.